It is that awkward time of year where it is not quite cold enough for a full on padded snow suit but I still want to wrap Archie up and a cardigan just doesn't seem as snug. Babyrug's innovative Bug in a Rug is a cross between clothing and a blanket and is perfect for this weather. The bug has a space for little legs and the elastic round the ankles stops the baby kicking them off. The middle section is a wrap over though, meaning a sleeping baby can be unwrapped with having to fiddle too much or wake them up. Perfect if you are coming in from the cold outdoors and they are fast asleep. The separate leg holes mean that the bug in a rug is so versatile. It can be used in an infant car-seat, in a carry-cot or pushchair and even in a sling, unlike a blanket, and the micro fleece material means it is lovely and warm. We have been testing the pale blue version on our newest addition and he seems to like it! I often wear him in a wrap and a snow suit is not practical so this is the perfect alternative for us. I love it in the carry-cot too as I find Archie can get too hot in a full on snow suit with the apron on as it tends to trap in the warm air. The Bug in a Rug is the perfect thickness and allows him to have a kick around as we travel. The Bug folds up so small, that it easily slots into the nappy bag if we are planning on staying out later and don't trust the Great British weather. I did find that the crossover body section didn't keep Archie's arms in as much as I would have liked, but I am not sure if this is him getting to the end of the size or not. I would love to see the velcro coming furthur round the body so I could wrap it slightly tighter and keep his arms wrapped up too. We are really enjoying using the bug in a rug and it is perfect for our little man as he is often in the pram for part of the day and in the sling for the rest, so it gives us more versatility than a blanket without compromising on his warmth. Baby Rug not only sell warm winter wraps, but also light cotton wraps, perfect for protecting a little baby's skin from the sunshine, whilst keeping them cool - much easier than rubbing in sunscreen every 30 minutes! I have one of the gorgeous summer wraps to give away to a reader and entry couldn't be simpler, just follow the instructions on the rafflecopter below! Disclaimer: I was provided with a bug in a rug for the purpose of this review, but all thoughts and opinions are completely my own. Love the Vulli Gnon toy - Sophie is already a firm favourite, and I know my little one would adore this one too! Love the fleecy Bug in a Rug wraps, and Sophie of course! The Australian SheepSkin Pram/ Buggy Liner - looks very cosy! The bug in a rug looks so comfy! 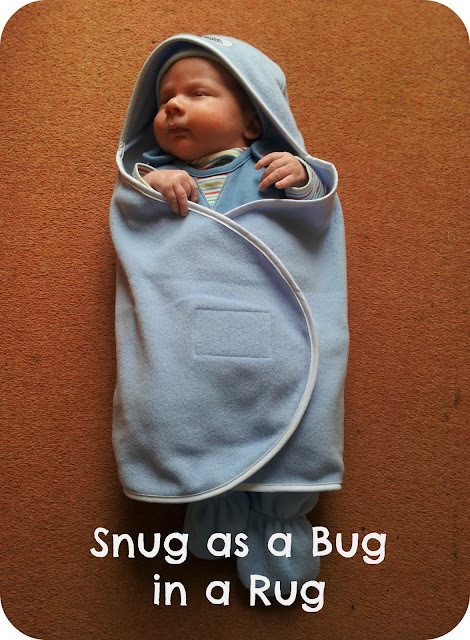 Bug in a rug - so easy to unwrap your sleeping baby to make sure they are not too hot! I like the Pure Cotton Wrap or the sun protection wrap, would be great for summer baby. The snug as a bug is my favourite or the extreme weather version. i like the Chan Pie Gnon . look cute! baby wrap summer sun protection looks great - shame they dont do adult sizes!!!!!!!!! The baby wrap sun protection looks great. The "The Great Swandoodle By Cuski" looks very useful - very versatile! Portable blinds - great idea! xtreme - Water Resistant Wrap is rather adorable. I am after something more practical than our swaddles and these cotton wraps look ideal for my little wriggler! The Great Swandoodle sounds rather fab! Sweet DreameezZ! for me too. Love the portable blinds - my LO sleeps so much better in a dark room. The Extreme Water Resistant wrap for the great Brittish weather! I love the Gro Anywhere Blind.